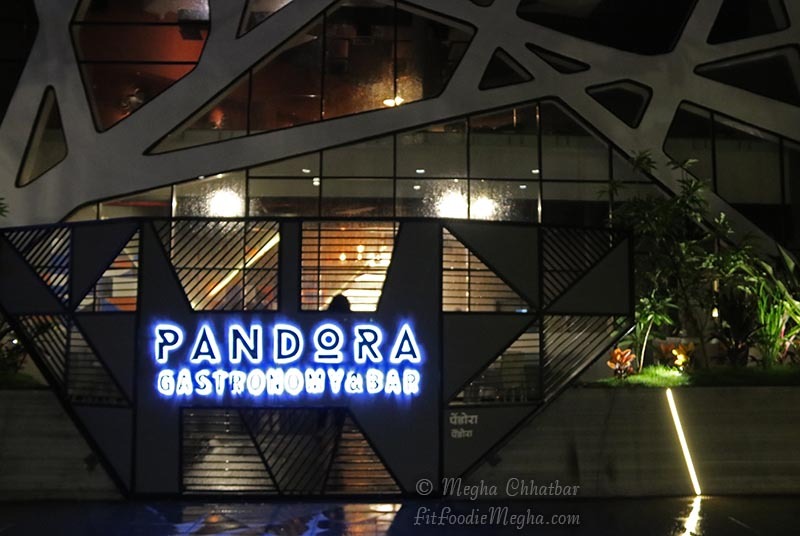 Fit Foodie Megha: Pandora Gastronomy and Bar – New and Improved! — Reviewed! Pandora Gastronomy and Bar – New and Improved! — Reviewed! This was my second visit to Pandora Gastronomy and Bar. Read about my first visit to Pandora, Pune. The beautiful modern ambience with handcrafted elements, lit outdoors, charming interiors remains the same, but what has been reworked is the wide menu. Some new dishes, some signatures are there on the menu now. It was really difficult for us to choose what to relish but since we were invited, some of the dishes were already waiting for us to be tried. Our evening started with the magical appetizing aroma presented on our table. The smoke was intended to increase the appetite. Then came the Citrus Bhel which was an added zing to the humble classic bhelpuri. Served in the cone over the cold jar, the bhel surely tantalises your taste buds with its tangy, savoury and spicy taste with added orange, pomegranate seeds and sour cream. Tamatar and Dhaniya Shorba was soothing, light, delicious and healthy. The taste was subtle and not too acidic. Packed with warmth and freshness, one can have the whole bowl easily. I am a salad person and the Arugula and Candied Walnut Salad was just top notch. The zesty salad was refreshingly simple yet divine. The dressing, walnuts, fresh arugula leaves everything worked well together. Honey Chilli Lotus Roots were next on the table. Undoubtedly, they are addictive. Sweet, tangy, spicy, crunchy dish topped with crispy fried rice thins was wiped off in no time. A must try! Next was the Tandoori Soya Chaap. This lip-smacking starter was flavourful. Generously marinated and grilled to perfection, the only drawback was the marination did not penetrate till the center and the soya was bit chewy. But overall, the taste was super yum especially the marination. The feedback was given to the chef and they are working upon it. Lip smacking Sri Lankan curry was made as per Indian palate and it was tasting more like a Thai curry with strong coconut flavours. With the first sip, the taste buds are tantalized and leave you wanting for more. Chunky veggies were adding texture. 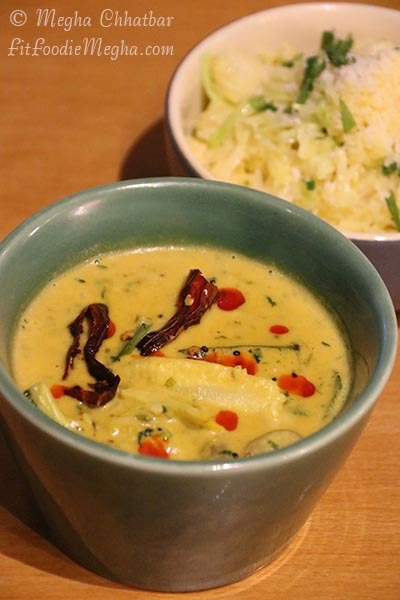 The spicy curry paired well with the cabbage coconut rice. Stir fried Chettinad vegetables were uniquely mixed and stirred in aromatic chettinad spices. It was strong but delicious. French beans, carrots are the important ingredients. Liked the preparation when combined with flaky malabar parotta. Then comes the dessert. Hazelnut and Salted Caramel Moelleux was not only visually appealing but a feast for taste buds. 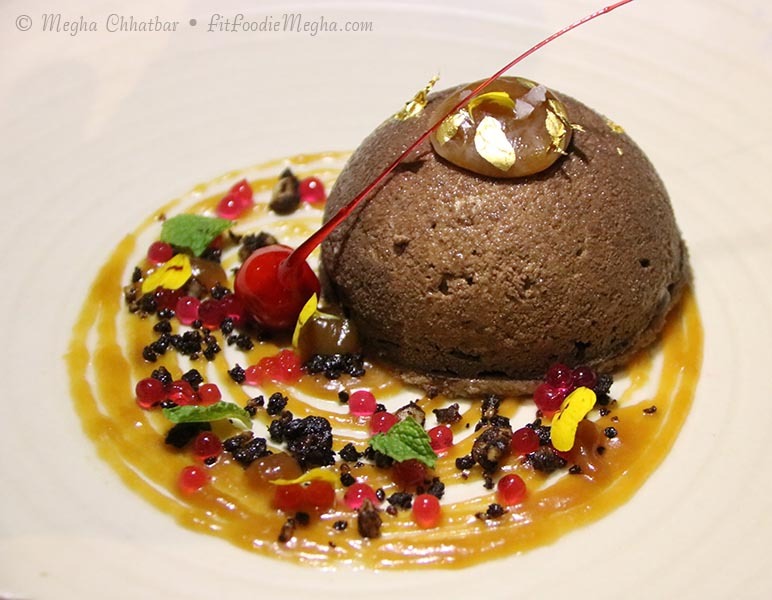 Chocolate and Salted Caramel are a deadly combination thus this absolutely sinful dessert was loved by one and all. The single bite of gooey chocolate with bite of salted caramel and almond mud was a party in the mouth. Must try! Rose Phirni Parfait was an epitome of dessert gastronomy. 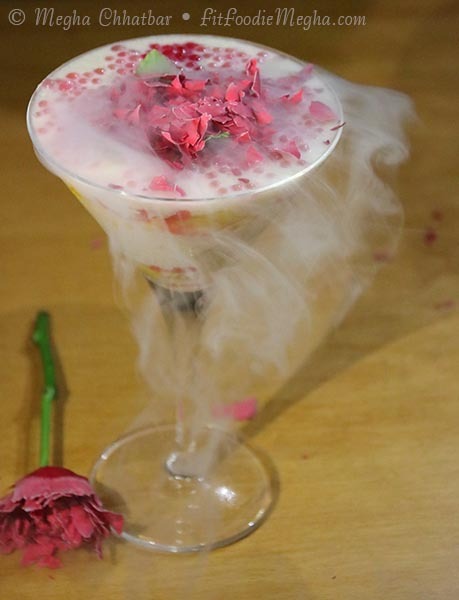 Rose petal phirni presented in the martini glass, decorated with rose pearls. The eye-appealing texture had perfect texture and mildly sweet taste. A must try. Overall, it was a fantastic experience. Recently they have also started Sunday Brunch, do give it a try! Do share your thoughts if you have been there and what are your favourites.